The Bertilsson brothers outside Marma in Sweden, run a diversified business, to say the least of it. Among other things, the offer sawing, planing, moulding and computer support. “We are the modern village smithy, you could say,” says Harry, the oldest of the brothers. The farm has been in their mother’s family for generations. Since their mother’s brother was not interested in taking over, the offer was passed on to her and her husband, who was then a carpenter. He reluctantly agreed to change profession and become a farmer. 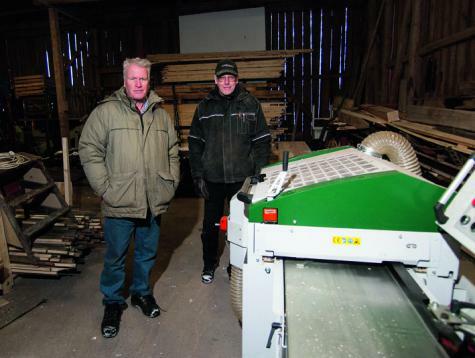 “Dad never let go of his interest in wood, but bought his first sawmill in 1967,“ says Göran. He passed on this interest to his sons, and when the first sawmill was worn out, they together bought a second-hand sawmill in 1992. This was a large piece of equipment, which, when it was manufactured in the 50’s, was intended for industrial use. But later, both sons went to make their living outside the farm. Göran became an engineer, and now works at a nuclear power plant. 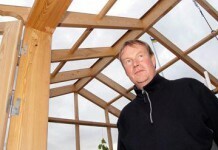 Big brother Harry started out as a toolmaker, and then qualified as a vocational teacher. The last years, before he retired, he was an IT coordinator. “Now I have time for my interests,” says Harry. Taking care of the family woods is one of them. It is with joy he brings his chainsaw out in the woods to find material for sawing and moulding. “Cutting timber takes no time,” he says. That is why the trees that were felled by the strong winds this winter, were already lying on the sawmill in February. 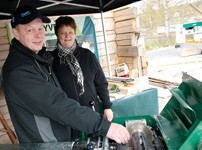 Two years ago, the sawmill they bought together with their father was replaced by a circular sawmill with a chain-driven log table. 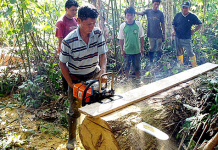 Here you have the capacity to cut large volumes of timber. 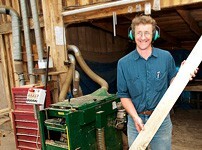 As everyone who owns a large sawmill knows, the customers are rarely satisfied with rough-sawn planks and boards. 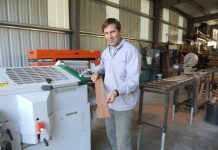 They want planed and moulded timber, and that is why Logosol’s four-sided planer/moulder PH260 is almost standard in this type of sawmill businesses. “In 1999 we bought a PH260. 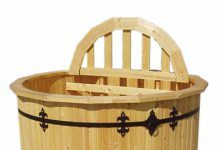 It has worked well, and we have machined a lot of timber over the years,” says Göran, who is in charge of sawing, planing and moulding in the business. But nothing is so good that it cannot be improved. The Bertilsson brothers were among the first to buy the larger four-sided planer/moulder Logosol PH360. It has already machined over 10 000 metres. “We needed higher feed speed and the ability to use knives with larger protrusion. We plane and mould a lot for listed buildings. 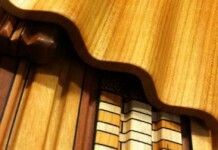 They often have wide skirting boards and other details with deep patterns,” Göran explains. • Larger motor for the upper cutter makes a great difference. You can without problems cut off 10 mm in one operation. 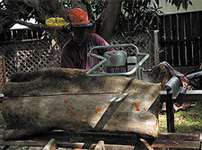 • The feed rollers are placed further away from the cutters. Due to this you can use knives with larger protrusion in the upper cutter head. • Fixed height on the machine table makes it easy to extend the in- and out-feed table and to integrate the planer/moulder in a production line. According to the brothers, raising and lowering the upper cutter together with the feed rollers instead of adjusting the machine table up and down, as is the case with the PH260, is a solution that works excellent. • The feed speed is more than sufficient. One person cannot manage to feed the machine with timber quickly enough when the PH360 runs at its highest speed. Up to now, the brothers have not run the machine at its highest speed, 30 metres a minute. There are many who wants to buy the new, larger machine, but wait because they know that the PH260 works well and are afraid that it will be hard to sell. “We put an add on Blocket a Swedish buying-and-selling site similar to e-bay and got paid more than we had hoped for. 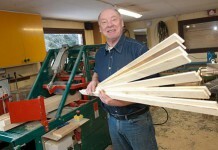 We were even contacted by a big planer mill,” Göran says. He asked why a big planing company wanted such a small machine. The answer was that it takes less time to machine a couple of hundred metres with a PH260, that it takes to set up the large industrial planer/moulder they had. 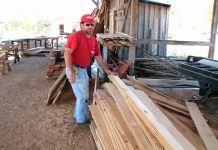 That is also why so many small-scale, wood-processing businesses can compete with large industrial sawmills and planing mills.